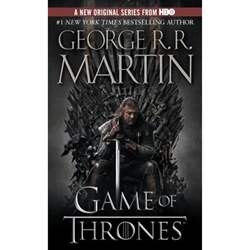 A Game of Thrones (A Song of Fire and Ice, Book 1) by George R. R. Martin is the first volume in a magnificent cycle of novels. As a whole, this series comprises a genuine masterpiece of modern fantasy, bringing together the best the genre has to offer. Magic, mystery, intrigue, romance, and adventure fill these pages and transport us to a world unlike any we have ever experienced. 4 3/16" x 6 7/8"